Following the terrible incident on Holloway Road last September 2014, when a Muslim shopkeeper being attacked and injured by a knife because he looks like a Muslim. Finsbury Park Mosque with other Muslim Mosques and community organisations had a number of discussions with the local MP, the Islington police, the Islington council and Islington faith forum regarding establishment of a community led forum to examine the Police management and investment of Islamophobic and anti Muslim hate crime on the borough. The aim of the forum is to build confidence between the local Muslim community and the local Police, identify improvements in the service delivery by the Police and increase safety and perception of Muslim people within the community. 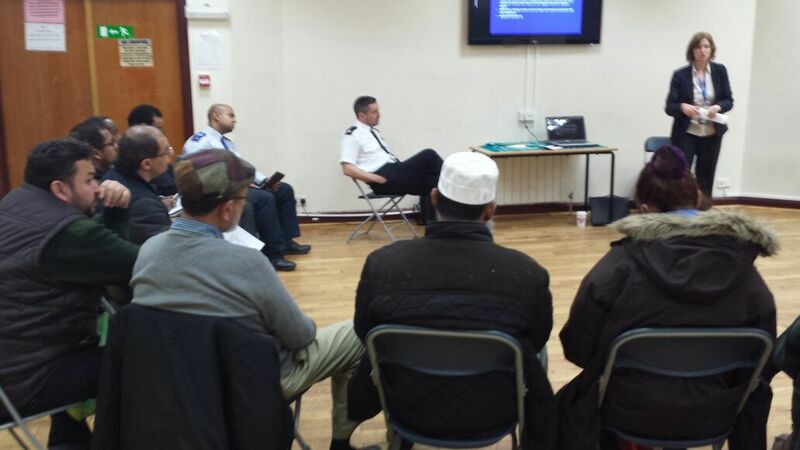 Finsbury Park Mosque hosted the initial community meeting with the Police and the Council where more than 15 Mosques and Community representatives attended. After the welcome from the Mosque chairman Mohammed Kozbar, a presentation by the Police on Islamophobic crime over the last 12 months and then we had a group discussions arising from the presentation and on how confidence in local policing and feelings can be raised in the Muslim community, also how safety and perceptions on safety can be improved within the community.